After months of speculation, Google launched its latest flagship smartphones, the Pixel 3 and Pixel 3 XL. The new Pixels are everything you could wish from a flagship smartphone, especially when they are backed by one of the most valuable tech brands in the world. The Pixel 3 and Pixel XL are worthy successors to the last year’s Pixel 2 and Pixel 2 XL with better camera, better sound, and bigger display. While Pixels are already known for their high-rated cameras, Google has upped the ante with its brand new Pixels which despite being a single 12.2MP camera setup, deliver superior studio-like photography experience, thanks to the Google’s new machine learning software. Like the previous Pixels, the new Pixel line-up comes in two size variants – the much handy 5.5-inch Pixel 3 and the much bigger 6.3-inch Pixel 3 XL. Here’s everything you need to know about the new Pixel 3 and Pixel XL and how they compare against each other. Pixel 3 is a relatively smaller-sized Pixel with a 5.5-inch screen and a significant upgrade from the last year’s 5-inch Pixel 2. Google wants to play safe with the smaller Pixel 3 but without compromising the design and aesthetics. The 18:9 displays looks great and even with the 5.5-inch display, it feels great on the hands making up for a perfect one-hand-friendly smartphone. The only downside is that it packs a below-average 2915 mAh battery which is nothing compared to the Pixel 3 XL’s massive 3430 mAh battery which adds in a few more hours to play with. Google also get rid of the 3.5mm headphone jack on the new Pixels, which is not a very smart move considering it’s an important hardware component. It features a high-rated 12.2MP (f/1.8 aperture) low-light rear camera with OIS for exceptional, life-like pictures. The dual front camera sensors are a great addition and help you take wide-angle selfies. What is Pixel 3 XL? Pixel 3 XL generates much of the attention for its massive 6.3-inch AMOLED display and flaunting its design philosophy is the deepest notch ever in a smartphone. The design doesn’t go so well with the massive display but the flagship, high-rated 12.2MP AI-powered camera compensates for all the design flaws. The camera is truly top-notch which can give an entry-level DSLR make a run for their money. The front shooter now packs a second wide-angle camera for life-like selfies. Like the Pixel 3, it’s powered by the latest Snapdragon 845 octa-core processor and Adreno 630 GPU, and packs 4GB of RAM for exceptional performance. Like the Pixel 3, it is backed by the standard IP68 waterproof rating which guarantees protection from dust, dirt and sand, and helps survive in water for relatively longer. – The bezels in the Pixel 3 are reduced significantly compared to the Pixel 2, but the massive and the deeper notch in the Pixel 3 XL is a noticeable addition to the Google’s flagship two-tone design. Pixel 3 looks more like the shrunken variant of the Pixel 2 XL but even with a larger screen, it is compact enough to be used comfortably with one hand and slips easily into pockets, which is the best reason to go for the Pixel 3 over the Pixel 3 XL. While the OLED panels in both the phones are calibrated to look almost identical, the Pixel 3 XL’s sizable, deeper notch makes a quirky addition. – While both are nearly identical in design, the Pixel 3 boasts a 5.5-inch 2160×1080 display whereas the Pixel 3 XL has a massive 6.3-inch 2960×1440 OLED display. The new Pixels are definitely bigger than the last year’s Pixel 2 and Pixel 2 XL. While the Pixel 3 is a great one-hand-friendly phone that can be easily manageable with one hand, the oversized Pixel 3 XL with its bigger notch is sure to be loved by many and it’s almost 12 percent wider and 8 percent taller than the Pixel 3. With the extra screen, you can always do more with the Pixel 3 XL. – While both the phones have classy and durable glass backs for a superior feel, the phones are also backed by the industry-standard IP68 waterproof rating which protects the phones from accidental spills and falls, dust, dirt, and sand. The most noticeable difference between the two Pixels is the battery. The Pixel 3 packs a below-average 2915 mAh battery which is nothing compared to the Pixel 3 XL’s massive 3430 mAh capacity. The 3430 mAh battery of the Pixel 3 XL is still behind the Pixel 2 XL’s 3520 mAh battery life. The Pixel 3, owing to its smaller battery pack, won’t last as long as the Pixel 3 XL. 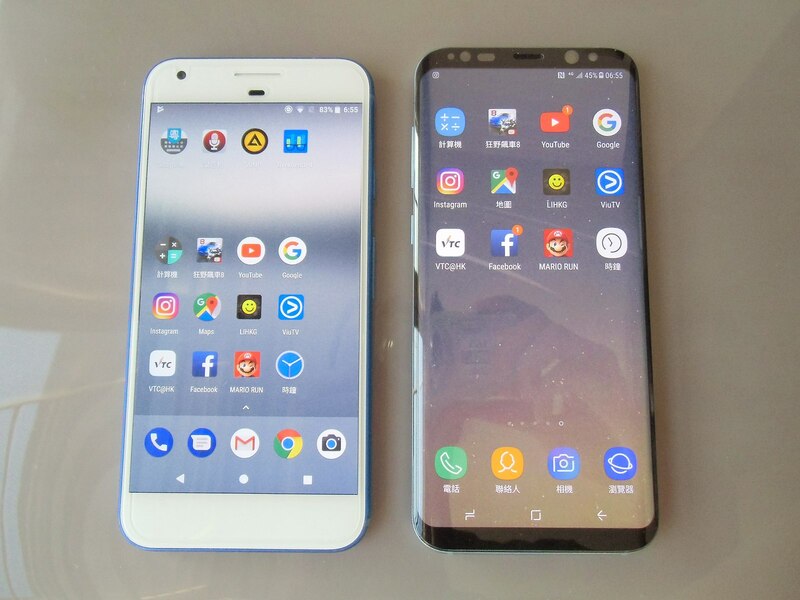 – The OLED screens in the new Pixels are an impressive addition to the new Pixel lineup and a quality upgrade from the last year’s Pixel 2 and Pixel 2 XL AMOLED displays. But bigger screens and top-notch displays come with a hefty price tag. 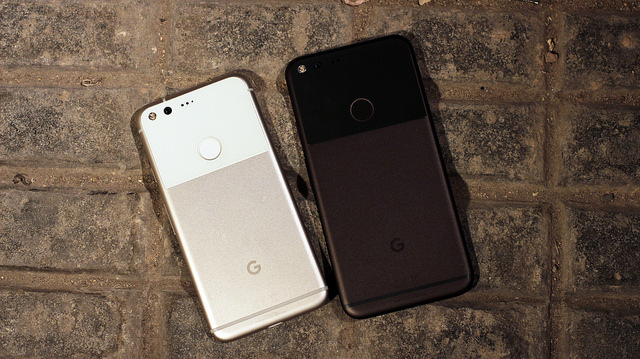 This is why Google kept the prices of its Pixel 3 marginally higher starting at $799 for the standard 64GB model and $899 for the 128GB model. The Pixel 3 XL, owing to its bigger screen, is priced at $899 for the 64GB model whereas the 128GB model costs a whopping $999. The Pixel 3 and Pixel 3 XL are bigger and better than their predecessors, the Pixel 2 and Pixel 2 XL, and they are arguably the best Pixel flagships till date and coming from the tech giant, Google has done fairly well to compete against its arch rivals Apple and Samsung. While both the phones are almost identical in design and aesthetics, the deeper notch in the Pixel 3 XL makes for a quirky addition and the massive 3430 mAh battery definitely gets you an extra mile. While the rest of the features stay the same in both the Pixels, such as camera, hardware and software, and performance, it’s the display size that sets the two Pixels apart. Sagar Khillar. "Difference Between Pixel 3 and Pixel 3 XL." DifferenceBetween.net. 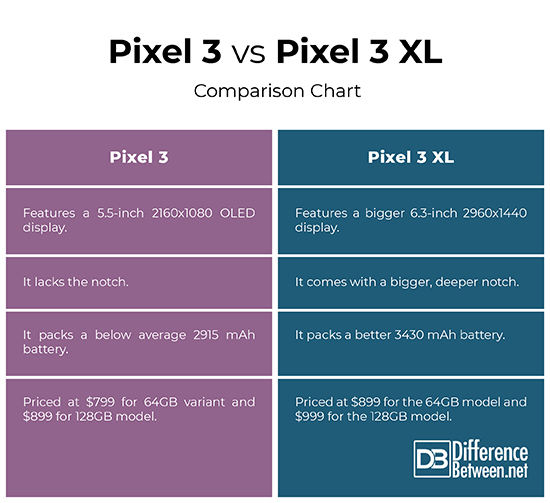 March 5, 2019 < http://www.differencebetween.net/object/gadgets-object/difference-between-pixel-3-and-pixel-3-xl/ >.